Late last week, the Associated Press attempted to troll President Donald Trump by claiming that his decision to withdraw from the Paris Climate Accord "may speed up" damage to his organizations' properties in Florida and other low-lying areas because of a "climate change"-driven acceleration in rising sea levels — by 2100. At the Weather Channel's Weather.com Friday evening, writer Pam Wright seemed to relish that prospect, and presented it as if it's far more than a possibility. One has to wonder if President Donald Trump realizes that pulling out of the Paris climate agreement could very well accelerate damage to his family's real estate empire in the not-so-distant future. Much of Trump's holdings are located in low-lying areas of Florida, including his Mar-a-Lago estate and Doral golf course. He and millions of other Floridians' properties are threatened by rising seas in the not-so-far-off future, according to projections from NOAA and the South Florida Regional Climate Change Compact. Ms. Wright essentially told readers that an experienced builder and real estate tycoon might be too stupid to even "realize" the alleged impact of alarmist "climate change" predictions on his properties. It would make you "wonder" how this ignoramus managed to orchestrate the design and building of so many wonderful properties and the growth of his enterprises — except that all of that somehow happened. Trump faces a similar problem in Hawaii, where he owns the Trump International Hotel and Tower in Waikiki Beach. In Ireland, a golf course owned by the president faces the same predicament. And did we mention his properties in Vancouver, Canada; Panama City, Panama; Uruguay and Mumbai, India? The U.N. Intergovernmental Panel on Climate Change said by 2100, 26 major U.S. cities will face an "emerging flooding crisis." The threat is particularly heightened during storms. Sea levels have already risen about 8 inches compared to pre-industrial times, and that rise has helped boost the surge and flooding damage during tropical storms and hurricanes. 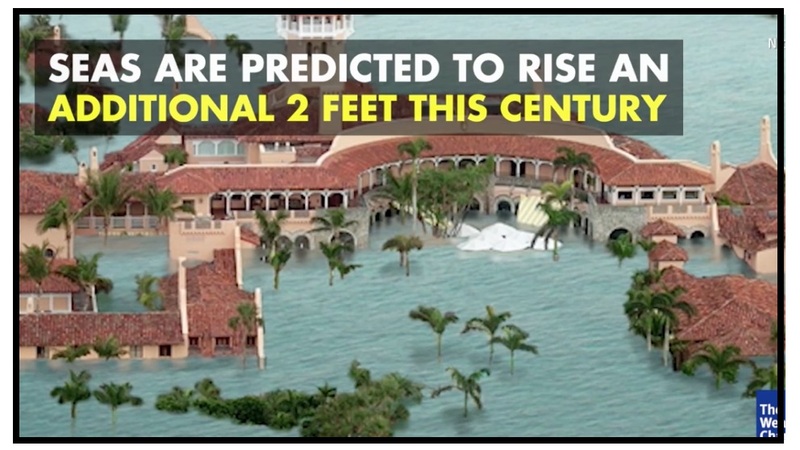 As sea levels rise as predicted — some 2 to 3 feet, or more, within this century — Trump’s 123-room Mar-a-Lago mansion and private club will soon include seawater covering its immaculate lawns. 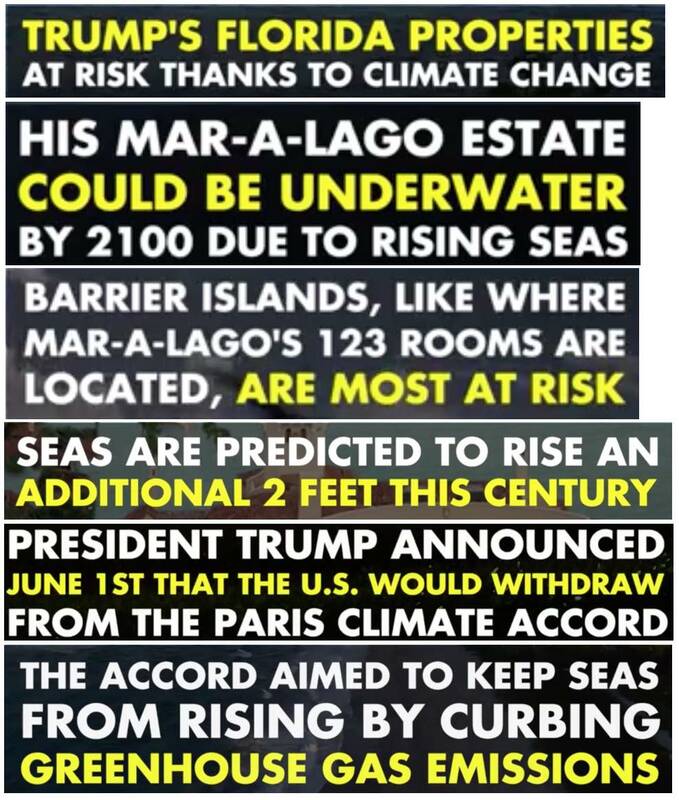 Now the "emerging flooding crisis "will" happen, and sea levels are set to "rise as predicted" — not "if" they rise, but "as" they rise. Wright turned that rise into a virtual certainty. 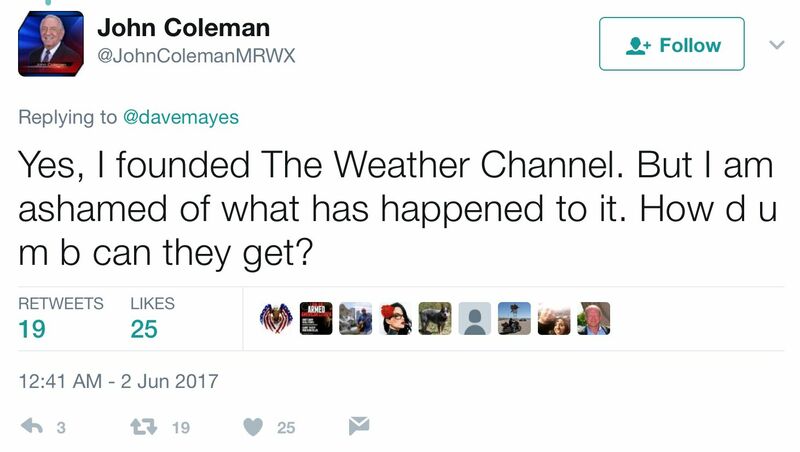 Now, for a far less alarmist perspective, let's go to Weather Channel founder John Coleman, as seen in two recent tweets. Sadly, John, they're probably nowhere near rock bottom. SO, I’M NO LONGER USING WEATHER.COM. I COULD TAKE CLICK BAIT. I COULD TAKE THEIR LESS THAN STELLAR WEATHER PREDICTIONS: But this stupid, ham handed insertion of politics, using stupid science as a justification, I will not take.